RYMCO is the local dealership for Nissan, Infinity and an array of other brands in Lebanon. They enjoy an overall positive reputation and have actively conquered a considerable market share due to various tactics and strategic choices, supported by an increasing popularity for the Nissan brand worldwide. Since its Alliance with Renault under the Leadership of French-Lebanese businessman Carlos Ghosn, Nissan has been a brand with vision. Our story goes back to November 22nd , 2013. 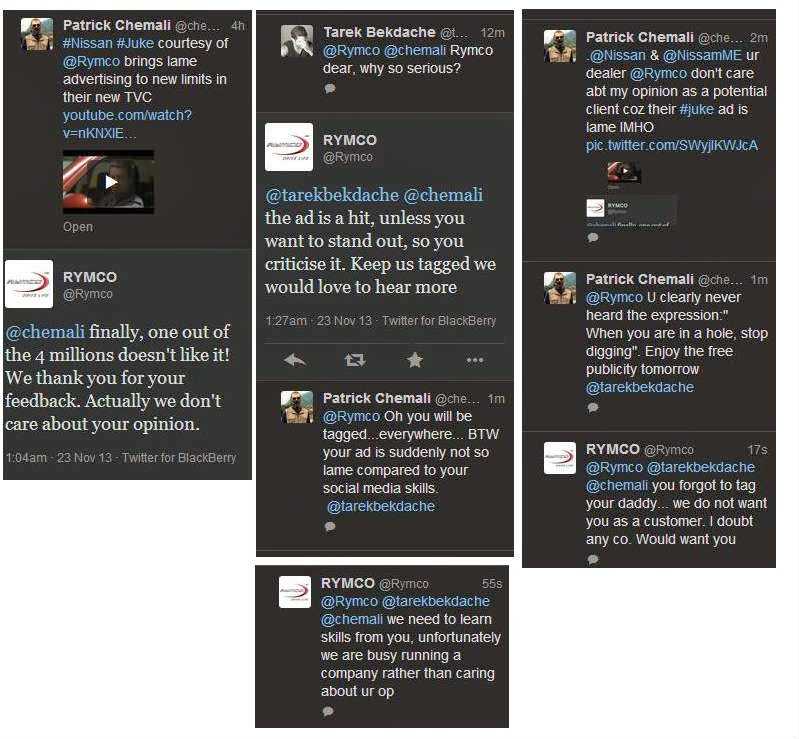 RYMCO had launched a massive campaign promoting the Juke a new crossover vehicle. While the car itself is not ugly and might be even labeled as cool by a younger audience, the TV commercial that was devised and aired (way too frequently) was, in my opinion, ill-thought for the following reasons. The ad portrayed reckless driving, even if it was confined inside an underground parking. The car's 4x4 capabilities are praised as the driver takes it on top of a very unchallenging, well laid out, nicely painted, gradually increasing in height barrels. You might not agree with my analysis but this was my view of the ad. It simply felt lame. This opinion was behind the unfortunate series of events that would follow. As I watched the ad on TV for the Nth time, opinionated as I am, I decided to express my discontent via Twitter by firing up a tweet where I tagged the company in the hope they would get more interested in why their ad seemed annoying to me (and perhaps to several others who shared my opinion). While I initially thought they would simply ignore me, their community manager, replying at 1 AM, did not take lightly to me being critical of their (his?) ad. It didn't take long for things to spiral out of control into what felt to me like an episode of The Twilight Zone applied to social media. 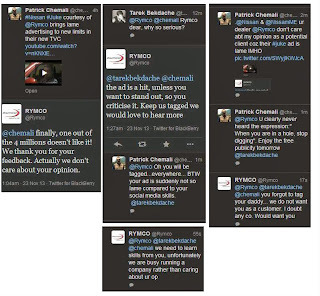 While I personally could have simply switched off, ignored the brand altogether (even if we were considering them for a car purchase plan) and went on to take my hard earned cash to a brand that would show a bit more respect, I felt that the public and consequently the RYMCO management needed to know about this. I used the screenshots from above to post on Facebook the following statement.